For the later Princess of Great Britain called also called Louisa, see Princess Louisa of Great Britain. 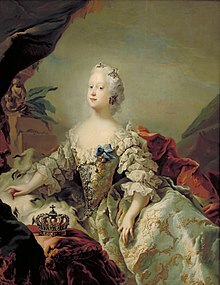 Louise of Great Britain (originally Louisa; 18 December 1724 – 19 December 1751) was Queen of Denmark and Norway from 1746 until her death, as the first wife of King Frederick V. She was the youngest surviving daughter of King George II of Great Britain and Caroline of Ansbach. Princess Louise was born as the fifth daughter and youngest child of the then Prince and Princess of Wales, on 7 December 1724, at Leicester House, London. She was baptised "Louisa" there on 22 December. Her godparents were her elder sister and two cousins: Princess Amelia of Great Britain, Princess Louisa Ulrika of Prussia (for whom Sarah Lennox, Duchess of Richmond and Lennox, stood proxy), and Frederick, Prince Royal of Prussia, later Frederick the Great (for whom Henry de Nassau d'Auverquerque, 1st Earl of Grantham, stood proxy). On 11 June 1727, when Louise was two years old, her grandfather, George I, died, and her father ascended the throne as George II. On 30 August, as a child of the sovereign, Louise was granted use of the arms of the realm, differenced by a label argent of three points, each bearing torteaux gules. In a dynastic marriage, Louise wed Prince Frederick of Denmark and Norway on 11 December 1743 in Copenhagen. A first ceremony was conducted on 10 November 1743 in Hanover with her brother, the Duke of Cumberland, as the representative of the groom. After this, the entourages of Louise and Frederick met at Altona, Holstein, where Louise exchanged her English retinue for a Danish one, headed by her new chamberlain Carl Juel and her head lady-in-waiting Christiane Henriette Louise Juel. Louise and Frederick then traveled together to Copenhagen, where they held their official entry into the capital, followed by a second ceremony with the groom present. The marriage was proposed by Great Britain. At the time of the marriage, both France and Great Britain wished to make an alliance with Denmark, and Great Britain had the advantage of being able to make a marriage alliance. Frederick's father, King Christian VI, hoped the marriage would lead to British support for his or his son's claim to the throne of Sweden. On a more personal level, there were hopes that marriage would suppress the frequent drinking and debauched behavior of the Crown Prince. The couple had five children, one of whom did not survive infancy. Although the marriage was arranged, the couple got along quite well, and at least during the first years, their relationship was described as happy. Frederick was comfortable with her, and Louise pretended not to notice his adultery with multiple partners, notably with Else Hansen. Though Frederick came to feel high regard for her and always treated her with kindness, however, he reportedly was not in love with her and continued to have affairs after their marriage. She quickly made herself popular in the Danish court, and her father-in-law remarked that she seemed to him to be kind and agreeable. When her husband ascended the throne, on 6 August 1746, as Frederick V, Louise became Queen of Denmark and Queen of Norway. Queen Louise was very popular in Denmark, and the great popularity of the royal couple has been attributed to Louise. Interested in music, dance and theatre, the royal court acquired a more easy-going tone than under her strictly religious parents-in-law. Louise had a vivacious personality, allowing her to socialize easily with others. In 1747, she arranged for the Italian opera company of Pietro Mingotti, whose members included Christoph Willibald Gluck and Giuseppe Sarti, to play at the royal court theater, and in 1748, the French Du Londel Troupe was invited for dramatic performances. "She has good sense and is easy with words, friendly in tone, knows how to converse on many subjects and can speak several languages; while giving court, she seldom leaves anyone without saying something nice; she very much enjoys dance and dances well, she has a good temper and is known for her piety and excellent qualities. She finds pleasure in reading and music, she plays the clavichord well and teaches her daughters to sing." Queen Louise unsuccessfully opposed the dynastic marriage between her daughter Sophia Magdalena and Crown Prince of Sweden in 1751. The reason was her fear that her daughter would not be well treated by the Queen of Sweden, Louisa Ulrika of Prussia. Louisa Ulrika was known for her anti-Danish views and for being opposed to the match, and it was known that she was the real ruler at the Swedish court. Reportedly, Louise also disliked arranged marriages because of her own marriage. While pregnant with her sixth child, Louise died due to complications from a miscarriage on 19 December 1751, a day after her 27th birthday, at Christiansborg Palace, Copenhagen, predeceasing her husband by fourteen years. She was buried at Roskilde Cathedral. ^ a b The London Gazette refers to her as "Princess Louisa"
^ a b c Bregnsbo, p. 347. ^ Gerd Ribbing (1958). Gustav III:s hustru. Sofia Magdalena. [The wife of Gustav III. Sofia Magdalena] Stockholm: Alb. Bonniers Boktryckeri. Bregnsbo, Michael (2004). "Danish Absolutism and Queenship: Louisa, Caroline Matilda, and Juliana Maria". In Campbell Orr, Clarissa (ed.). Queenship in Europe 1660-1815: The Role of the Consort. Cambridge University Press. pp. 344–367. ISBN 0-521-81422-7. Wikimedia Commons has media related to Louise of Great Britain. This page was last edited on 3 December 2018, at 12:17 (UTC).